In my last post, I mentioned about the mindset of people regarding success. Different people may and do have different criteria for judging success. But, usually, in the end it comes down to how others judge people about their success and not people themselves. As a nation, I guess, we are becoming ever so obsessed with success. Be it the results of our national cricket team or be it the results of an election, we just cannot take failure. But what exactly differentiates success from failure ? Last night, while once again watching the news on the television, I came across an incident from Delhi where a girl had jumped to her death from the balcony of her house. Reason ? She had failed to get admission in a reputed college after missing out on the cut-off list while most of her friends made it in. Ok. One can understand that she must have been highly disappointed at her ‘failure’. Even more so as her friends had succeeded in achieving the common goal. She didn’t do well enough in her boards. So, obviously it was a failure for her. But the next revelation in the story made me almost cringe. She had scored no less than an aggregate of 93% in her board examinations… !!! To be honest here, if I would have scored that many marks (in any examination whatsoever) I wouldn’t have stopped jumping for joy till someone would have brought me down to earth. Scoring 93% in any examination itself signifies that the person has performed much more than just average. Even most of the examining boards categorize anything over 90% as excellent. For this girl, the same result was no less than a tremendous success at one level, but it was a big failure at another. Failure as in the eyes of others. Shouldn’t she be happy at her success ? Hadn’t she performed excellently in her studies ? But the failure was big enough to overshadow what she had achieved. And the only option she could choose was death. Why are we so obsessed with results ? And successful results at that ? We just don’t seem to have the ability to use failures as motivation for future success. In fact, we are absolutely intolerant to failure. Be that our own failures or those of others. We are never ready to put it behind and move forward. We are dead scared of failures… !!! What if that girl could have got into a not-so-reputed college, studied hard enough to become something even better than her ‘competitors’ studying in the reputed colleges ? Wouldn’t that have been a sweet and satisfying success ? But as I said, we want to be successful enough to stay level with others, but we cannot accept a failure which could be a stepping stone to move ahead of them. I think it is natural for human beings to try and be superior within their race. This relegates the need for happiness and contentful living. This is a sad and unhealthy trend for today's youth. Unfortunately some people still havent understood the concept of globalisation and its impact on the opportunities available. Sighh. You write very nicely.. Agree but I guess the reason is tooo much of competition in this world.. she must have been worried about her parents (they might have scolded her), other kids (who might taunt her for not getting admission).. I guess its parents who need to convince her.. even when I missed 100 in maths by 1 marks, I cried for 2 days.. my mom scolded me saying "it does not matter" and made sure I understand that it is not so important.. but it was more like "my dream did not come true" and that "my classmates did it but I did not"
I agree with abstract scientist. We really DO need to broaden our perspective. There is a lot more to life than getting admission into LSR, New Delhi! We Indians have become too marks-oriented... rarely bothering to find our special aptitudes and skills, and putting them to use. It's all about numbers here... first the marks, and then the salary! Besides, failure is only a matter of perception... what one person might deem as failure, the other would consider it a major success. 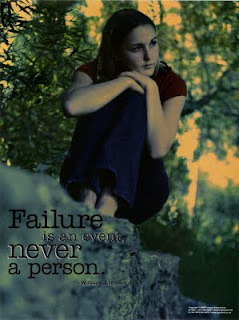 I wonder if you read this post of mine... "Failure is Never Final". Hey I tried inserting a link here to that post, but for some reason, your comment form doesn't let me copy paste stuff into it! So u'll have to type this title in the search box on my blog, and it will take you to the correct post. I agree with what you said. But trying to be superior doesn't mean giving up at the first failure. That's the point I'm trying to make here. Exactly. The parents are the ones to come to the child's rescue in such a situation. But instead, most parents add to the pressure to perform better than excellent. But do they really give you a hundred ? I guess in our days, 99 meant getting a hundred as a 100 was never given. I'll continue with what you said about not putting our special aptitudes and skills to use. Oh. Doesn't my comment box allow you to copy and paste ? I wonder why. It allows me to. I'll link your post in the continuation of this post. Exactly Shobhit. I agree with you. There are many examples in this world where people who faced failure have attained fame and fortune. The question is not of fame and fortune anyway. As Kaddu has said sucess is a matter of perception. I would like to believe what our many ancestors have said: success is happiness, so try and pursue it. But my story is absurd and funny at the same time. I don have a job cz of my marks. I take it as my failure. But I have learnt from it and I am still waiting and striving for my dream job when my classmates are working in multi-national companies. But my mom thinks I have touched success and they have not cz they are not yet married and I am. The funny part is, when I tell my mom that my friend who is working in Infosys is getting married, her reaction is a relief as if a failing student is miraculously passed. I am bad in social studies (History, Geography, Civics, Economics). In my tenth standard, I scored 64 and my friends scored 97,98 etc. They won 1st and 2nd in district. I went to the teachers and thanked them cz my average marks in the subject were 30s. They were so happy cz none of the scorers met our them. They congratulated me for getting 64 in the subject. Failure is all about how you take it. I can see people who got more marks than me and cry. I can see people who got less marks than me and be happy. Exactly. Failure is when you yourself analyze if you were unable to achieve something which you were striving for. But each failure should be the stepping stone for the success one wants. And I don't think happiness is related to success. As success is usually analyzed by the views of others, they can never know what exactly makes you happy. So, even if one is a failure in the eyes of others, one can still be honestly happy.